Our hostess this week is Heather Robinson who has selected the theme “history”. Heather created this gorgeous arch depicting events from the “Titanic”. She challenges you to make a gothic arch using events from your personal history or history in a broader sense. Rubber stamping launched me on the artistic journey that I am on today. Although I don’t use rubber stamps in the same way today, they still make their way into my artwork. My interests now lie primarily in mixed media, collage and altered books and I just can’t seem to shake an obsession with using wax in my artwork. “Titanic”, especially the stories about individuals who were on the ship and that is what I hoped to capture with my arch this week. I look forward to visiting your blogs and seeing your interpretations of the theme. 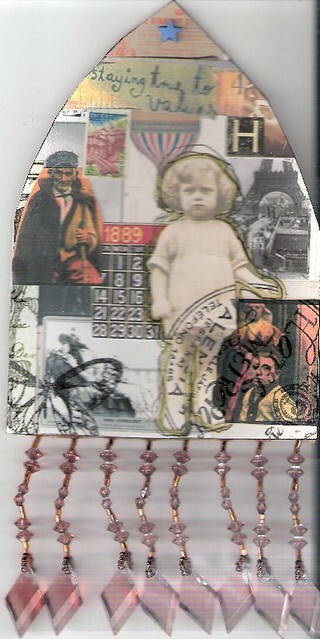 http://creativesolace.blogspot.com to see more of her amazing creations! Here’s my arch this week. What an honour to be the host. A fantastic Theme. Here is my arch. Thanks for looking. Difficult one Heather! but here is mine. dit is deze week mijn bijdrage. Heather thanks for your great theme. Great theme Heather! Made me think! Great theme!! Here’s my entry! Wonderfully inspiring theme — thank you! My entry for this week, a very special lady in Dutch History. Thanks for watching my Log. Here is Mary from a troublesome time in English history. Thanks for looking. Great, one of my favourite themes ! Thanks ! Here’s my History gothic arch! This was a great challenge to create, thanks Heather! I had to think about this one before starting… ANOTHER FUN CHALLENGE!!!! Here is my historical entry. I hope you may also have a look at my new challenge blog too. This theme was perfect for me this week. Here’s my entry and the story behind it. This is a part of my history, nice theme. Fun theme! 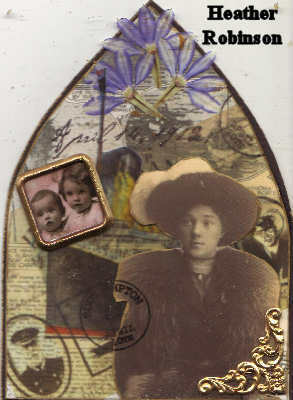 I posted mine today at http://art-interrupted.blogspot.com/. Better late than never! Here’s mine. Congrats on being the hostess this week Heather!!!! Love the theme. I enjoyed your fascinating arch – than I would an actual ferris wheel!!! Oh, dear – not keeping track of the pages – apologies for the above!!!! Wow, we have a huge turn out this week – here is mine! Finally I got time to work on this theme. I loved it! I choose to make an arch about Mata Hari. this is one of my favourite “Objects of Beauty”. I would love to participate. My entry my be a little bigger than a piece of paper… It is our Art House. It all started with the discovery of 7 old gothic arched windows from 2 different churches found in very bad condition. But you don’t come across these every day so we built our house using them as key points in it. We brought them back to life & even turned one into an interior door. It has been a labor of Love. Feb. 12… Exterior view of our home we designed & built ourselves… took 8 years. We love art & we work big sometimes & yes I went on too long but you have a topic here that I absolutely LOVE.